Updates to Dr. James' profile since your last visit are highlighted in yellow. I have seven grandblessing and one on the way. All our children are successful business people and all live in the Jacksonville area and go to our church at River City Family Church. I currently teach at Lake City Community College, Jones College, and am trying to get on at Liberty University and Jacksonville University. I am a retired American History teacher in Duval County Public Schools. My wife is a retired executive from Washington Mutual. His wife Amber is expecting! 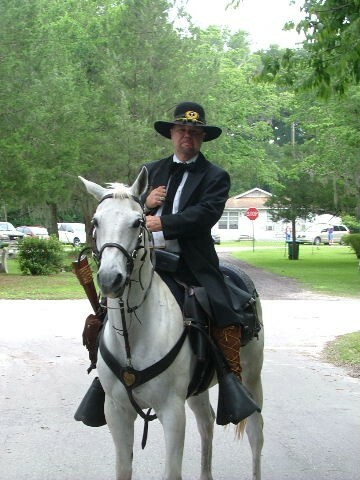 I am into Civil War and Cowboy reeacting and have been in several movies and magazines over the years. I like Team Penning, Scuba Diving, Snow Skiing, golf, horseback riding and fishing. There was a student that I will not mention by name that was having a rough time dressing for P.E. I used to give the guys 5 minutes to change and then go in with a broom and drive them out. I got a note from his mother asking me to have patience with him. They were practicing dressing for P.E. at home!!! Good news! Bad news!! Over the years, I lost Goliath and Oscur!!! Anyone remember Big Red? Dr. James Gipson has a birthday today.